Do you operate Fatigue-Regulated Heavy Vehicles? If your company operates vehicles with a GVM over 12t or a combination when the total of the GVM is over 12t you need to be aware of your responsibilities under National Heavy Vehicle Laws and Regulations. One of these responsibilities is that you will manage fatigue. As a part of your Smarter Safety Integrated Management System you have a documented Fatigue Management Plan for Heavy Vehicle Drivers. This is either WHS-06.1 or OHS-06.1 depending on your state. 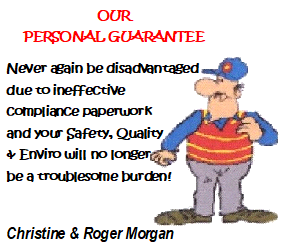 You need to ensure all of your drivers are aware of this document and their responsibilities. In order to correctly manage your Fatigue Management responsibilities, you are required to keep records of your drivers work and rest times and these should also be audited for accuracy. For some of you your drivers will be keeping a National Driver Work Diary but for those who are not, a written record of this information needs to be kept. Your IMS should be easy to understand and easier to use. Too much Christmas cheer can leave you with a liability! Did you know that you can be held liable for the actions of your staff at a work Christmas Function? Employers have a duty under workplace harassment and discrimination laws to take all reasonable steps to prevent harassment and/or discrimination from happening at work, and this extends to the workplace Christmas party! 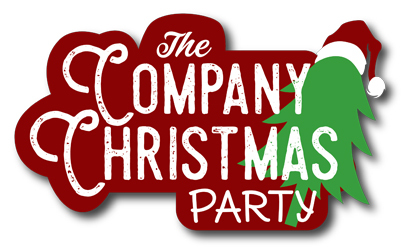 Christmas party, a few drinks and then someone does or says something that offends another and it ends up having serious ongoing negative consequences for your staff and your business beyond that one night. Add the potential $ cost of claim against you for the drunk actions of just one staff member at your party, which could be anywhere upwards of $10,000!!! WorkSafe will soon be wanting to see documented proof of how skills were achieved, not the fact that workers have them. How good is your training register? Do you have a Training Register? 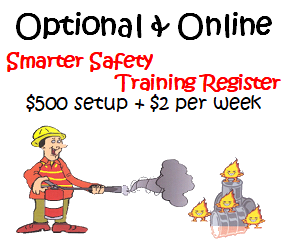 The Smarter Safety online Training Register better manages all your employee records. It integrates with your SmarterScreen user file so is a very easy setup. Select your own headings and enjoy personalising your records the way you want them. Christmas time fatalities... no deadline is worth someone’s life! We know that the lead-up to Christmas is busy with employers and workers rushing to complete projects and meet deadlines. But it is a horrifying fact that workers are more likely to die in November and December than any other time. Read the whole INCREDIBLY IMPORTANT story here. Is your business just plodding along? Looking for a better way? It isn’t rocket science: in fact it is amazingly simple. 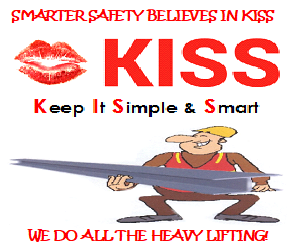 The whole Smarter Safety system is easy to understand and even easier to use. Because Smarter Safety does 8-10 Tenders each week we know the questions being asked. Each client’s MSO contains detailed answers to those questions. The MSO is the BEST advertisement our clients have to promote their business to those principal contractors they want to work for. Do you promote your unique points of difference? The Smarter Safety IMS is on the cutting edge and leading all the others. An easy to understand and easier to use system. The best method of delivery. The broadest support in the industry. 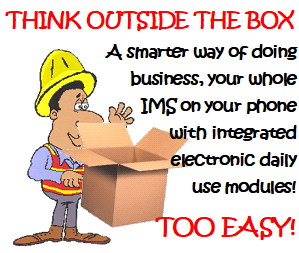 Innovative electronic modules making it almost paperless. 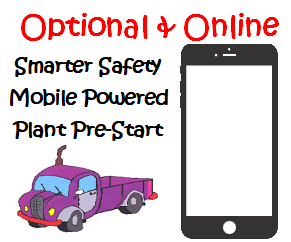 Do you action a Mobile Plant Pre-Start before commencing work with your machine each day? It is law and all OK until something goes wrong. A litigation lawyer could leave you with zilch! No machine, no business and no house! The online option is brilliant. Do you action a Site Hazard Risk Assessment / Toolbox before commencing work each day? It is law and all OK until something goes wrong. A litigation lawyer could leave you with zilch! 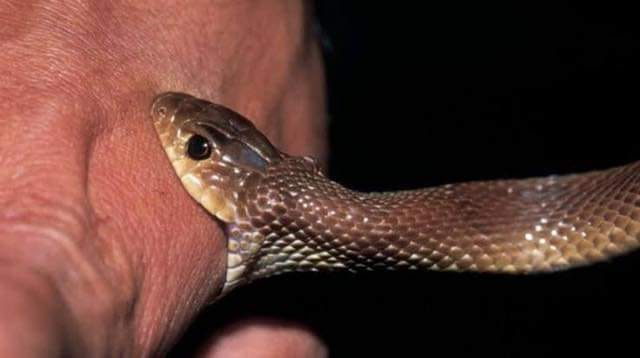 No business and no house! Image shows our paper version, we have an online option also. Those road workers improving our driving experience have mums, dads, husbands, wives and children. Their lives are precious. 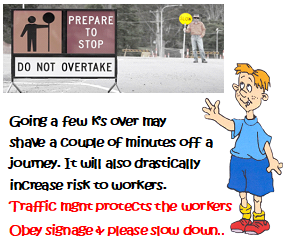 Please slow down and obey the temporary speed restrictions. This one is a real "no brainer". Are you still printing heaps of paper and making lots of phone calls in an endeavor to ensure you have them all and they are “in-date” and accessible to all at all times. Smarter Safety sources your SDS for you and then maintains and updates them as required for compliance. All are online and accessible by any employee or subby with authorised access from a mobile phone. 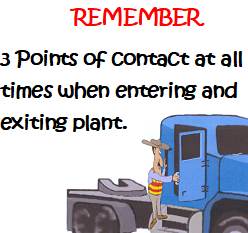 Avoid slips, trips and falls when entering or exiting plant by ensuring 3 points of contact at all times. work as fall protection (if the shield is 900mm out of the ground, otherwise edge protection will need to be fitted to the shield). lack of traffic management on the road. Never take shortcuts with trench safety. Perhaps it is time to re-read your Safe Work Method Statements or possibly get them updated.